Tattoos (If any): A tattoo of a two pistols crossed on his back. Piercings (If any): Two along the bottom of his left ear just above the lobe. Preferred Style of Clothing: A standard police uniform with a skinny blue tie and black undershirt. Personality: Calm, analytical, serious when need be. Talents/skills: His analytical skills are superb. His aim is pretty good. He can also read things uncannily fast. On a side note, he can down an entire bowl of ramen in five seconds. Digimon Description: A short, purple and yellow dragon rookie digimon. Digimon's Personality: Silly, serious when Arano is, lazy. How/When You Met Your Partner: The two met at night in a grassy field as Arano layed and looked to the sky. Drake, then just an in-training digimon, approached Arano and asked to join. Arano had no idea what Drake was and swiftly drew his gun. After it was apparent that Drake offered no threat, Arano lowered his guard. Their personalities seemed to mesh, so they became partners. Situation of the character's birth (where, when etc): Arano's mother was rushed to the closest hospital in tokyo. After hours of labor, Arano was born, but his mother died. 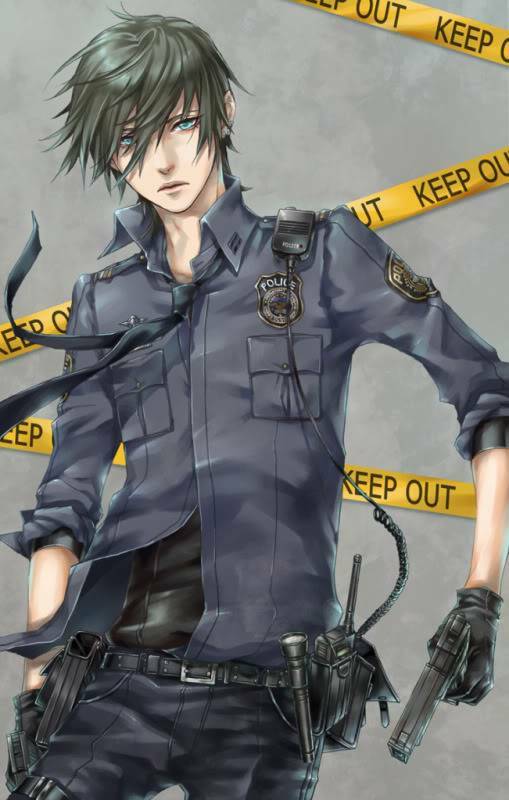 How/When Your Character Arrived In the Digital World: On a mission for the police department, Arano was assigned to infiltrate an abandoned lab that was labeled for recent suspicious activity. He found nothing be a strange gate-like device. Out of no where, the gate opened a portal to the digital world. Arano was then pushed in by a shadowy figure. Describe their childhood (newborn - age 10): After living with his father for 6 years, his father died on a mission with the police department. Arano didn't cry. He just vowed to himself that he'd become the best cop ever to make his father proud. He was moved in with his aunt and uncle and was loved just as if he were theirs. Adult years (20 on): On his 26th birthday, he was sent on a mission for the department to check out suspicious activity in an abandoned laboratory. A shadowy figure pushed him through a strange portal to the digital world. He camped the first night out in a grassy field and it was there that he met his partner. They trained together and roamed the digital world for about a month. In the process Drake digivolved into a Monodramon. Now, they've come to a rather out-of-place-looking hill that towered above all the trees in the forest they were in. On top of the hill was a building. They looked at each other with a confused expressions and looked back to the hill to begin their ascent. As they reached the top of the hill, they read the sign hanging on the building. The sign read "Tamer HQ". They headed in, and this is where their true adventure began.